The boom lift is an aerial work platform providing temporary access for personnel or equipment to inaccessible areas, usually at height. 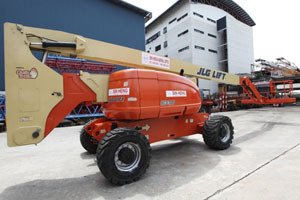 It comprises a lift (or bucket) at the end of a hydraulic lifting system mounted on a self-moving platform. The boom lift is fitted with either a straight or an articulated boom, consisting jointed sections, which can be controlled to extend the lift in a number of different directions. The boom lift is usually designed to be fully operated (including setup) by a single person. 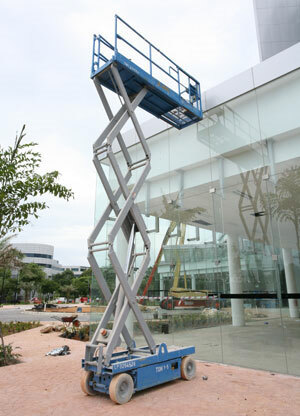 The scissor lift is another type of aerial work platform. It comprises a lift at the end of a set of linked, folding supports in a criss-cross 'X' pattern mounted on a self-moving platform. The lift is capable of vertical movements and can be extended horizontally to allow closer access to work areas. The scissor lift is also designed to be fully operated by a single person.